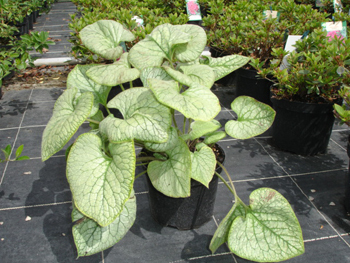 Brunnera are also know as forget me nots, they are a gardeners favourite as they tolerate the shade really well. They are very low maintenance and have long lasting sprays of brightly coloured flowers. They are also the perfect ground cover plant, that has large leaves and can some varieties can be variegated. Its common name bugloss refers to the Greek name for ox tongue which again relates to the shape of the leaves. Unfortunately they are tasty to slugs and snails, so get out early with the pellets but they are perfect for areas where deer are prone as they will not eat them.